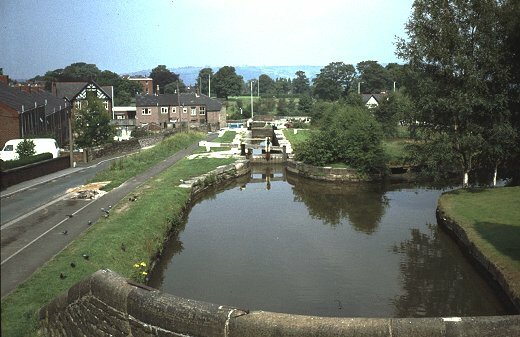 This photograph looking at Lock 14 from Lock 15 locktail bridge, thought to be taken in the sixties, shows a much harsher scene than the present-day shot below, which has been softened by the growth of trees and shrubs. Of course there were some advantages to fewer trees in that you got a much better view in those days. The building with the black and white gable to the left was the Liberal Club on Stockport Road, sadly no longer there, and Hollins House in Memorial Park can be made out in the background too. During the winter of 2017 the Canal and River Trust replaced the gates in Lock 14 and and also held an Open Day to let people see inside a drained lock. 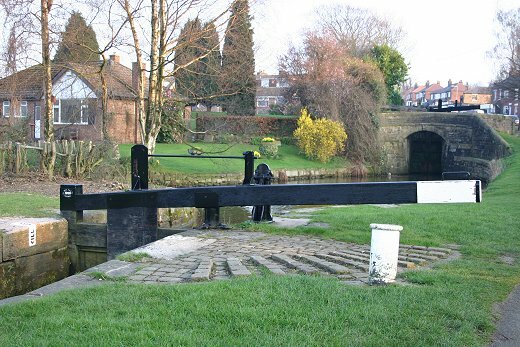 It was the photograph of Lock 14 below, looking in the opposite direction towards Lock 15, that was used to create the design for a brass plaque to commemorate the Bicentenary of Marple Locks' original construction in 1804. 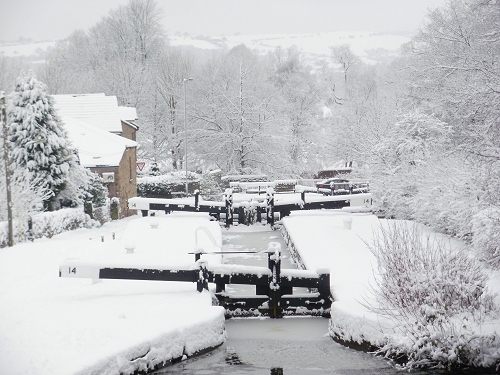 Lock 14 in the snow - Terry Wood. Canal and River Trust repairs and Open Day - Arthur M Procter. Lock 14 plaque inspiration and design - Mark Whittaker.